Molokai Tours are unique among tours on all islands. We offer many at discount pricing. The islands of Maui, Molokai and Lanai make up Maui County and Molokai is most easily visited by air transport. Of the three islands that make up Maui County, Molokai stands out as having the closest link to old Hawaii. This cultural heritage can best be understood when enjoying one of our Molokai tours. In many ways, landing on Molokai today is similar to arriving on Maui 25 or 30 years ago. The sleepy town of Kaunakakai, the uncrowded roadways, the country homes, the fishermen casting their nets, the pidgin English, the roadside churches of an era past, the community baseball games and canoe races, the small-town feeling where everyone knows everyone else - all contribute to a heartwarming, if not nostalgic, experience. 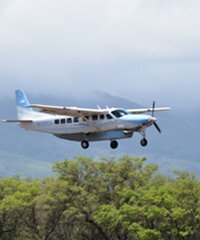 Fly to the Molokai Airport and Rent A Car for the day. You can spend the day exploring at your own pace, visiting beautiful beaches, rainforests, picturesque shoreline, and historical sites. You might want to pick up a picnic lunch in town and enjoy it at a shoreline park or overlook. The day is yours and you can do whatever strikes your fancy. 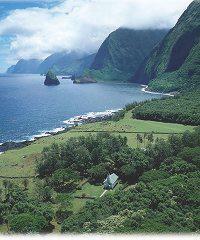 Take one of our guided topside Molokai Tours or Kalaupapa Tours down to the peninsula. On the 'topside' Molokai Tour you'll be guided around the island of Molokai by a local who has probably spent a lifetime on Molokai. The things you will learn, the places you'll see, and the hospitality and local color provided by the driver make this a great choice for anyone who really wants to get acquainted with Molokai. This is the quickest way to understand the essence of Molokai, also known as the "Friendly Isle". Tour Kalaupapa Peninsula, the site of Father Damien's leper colony. On the northern coastline of Molokai, sheer cliffs descend 2,000 feet to the lovely and isolated peninsula that served as home to Hawaii's leper colony last century. Even though "Hansen's Disease" has been arrested in modern times, this is still the home of the few remaining patients. Kalaupapa Tours are given intermittently through the week. The narrative is so informative, so touching and so steeped in the dramatic history of the era, we guarantee you will be moved by the experience. 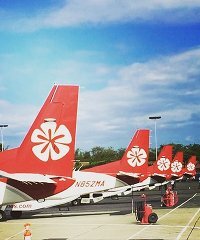 The best way to visit the peninsula is by airplane on one of our special Kalaupapa tours. 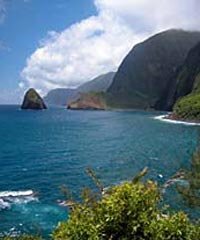 Few adventures in Hawaii are as unusual as this experience at Kalaupapa. Do you still have questions about Tours of Molokai? Why is the Saint Damien Leper Colony such a treat to visit?